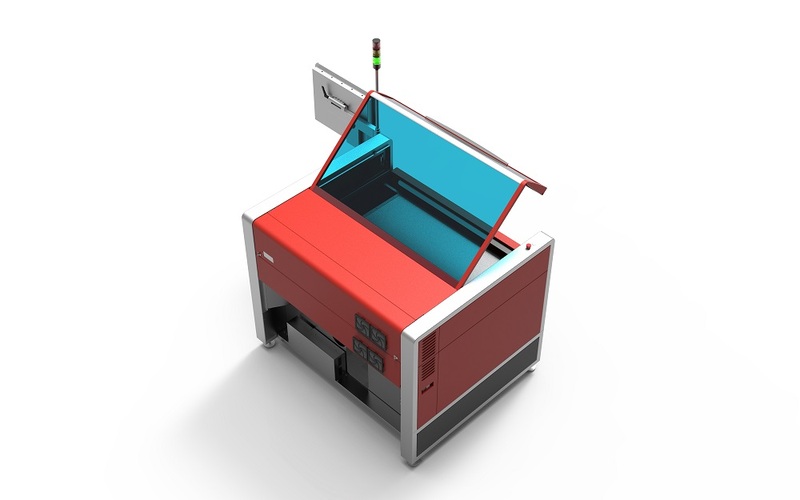 The ULTRA 9 platform offers laser material processing for the widest possible range of materials. 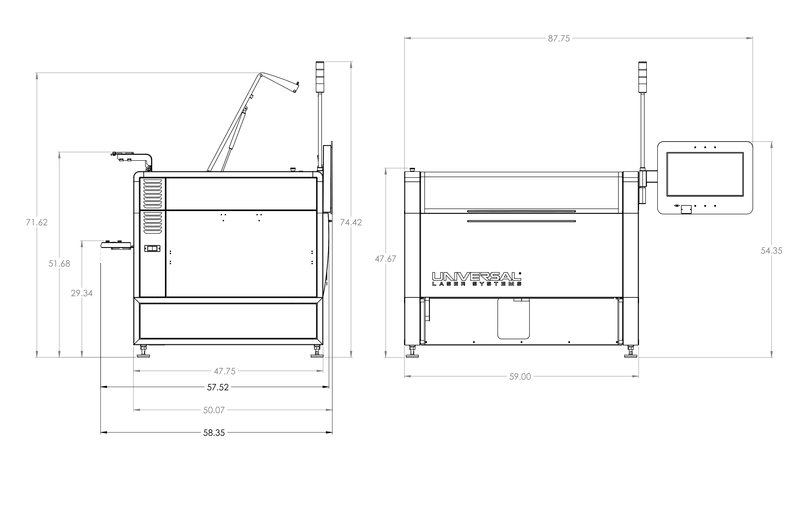 It is designed and ideally suited for precision material processing in manufacturing, research and development, academic research, and prototyping environments. With its unique modular architecture, customizeable solutions can be easily reconfigured with a wide array of options for enhancing performance, capability, and safety to complete the perfect solution to meet present and future business needs. 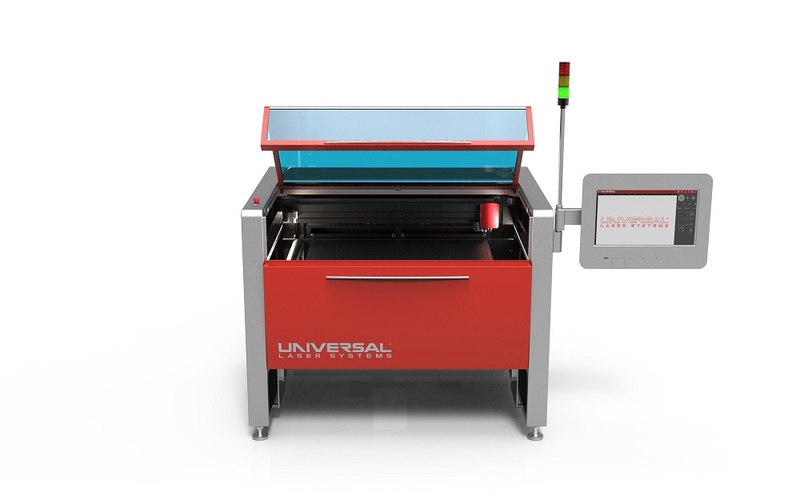 The ULTRA 9 platform has a materials processing envelope of 36 x 24 in (914 x 610), with support for materials with a thickness up to 12 in (305 mm). 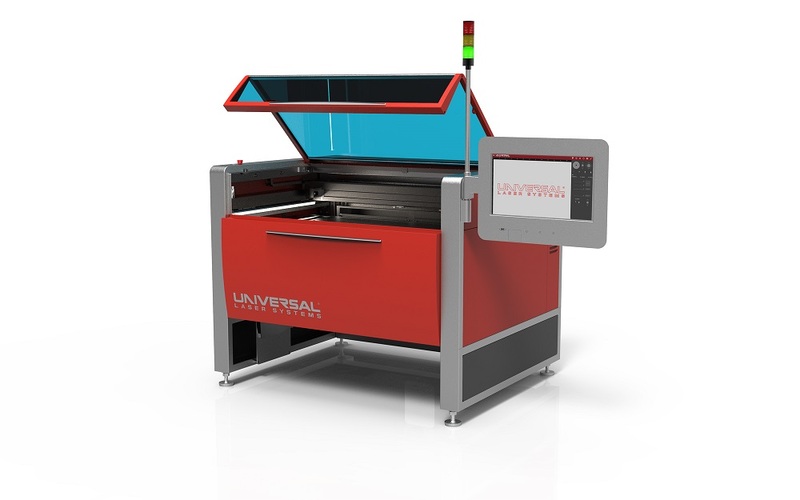 Configure the customizable ULTRA 9 platform with up to three laser sources consisting of two interchangeable CO2 lasers and one fiber laser. When the platform is configured with three lasers, users can take advantage of MultiWave HybridTM technology enabling up to three wavelengths – 9.3µm, 10.6µm, and 1.06µm – to be simultaneously combined into a single coaxial beam. Each spectral component of the beam is independently controlled and can be modulated in real time. Major features include rapid, high-accuracy laser beam positioning, precision focusing with autofocus, adjustable laser power density, an automation interface, camera registration, an integrated touch screen user interface, fire detection and support for suppression. Gas assist can be programmed to switch between compressed air and other non-flammable support gases such as nitrogen. Users can program use of gas type and flow level on a process-by-process basis within a design file. Material collision detection is built into the coaxial gas fitting on the carriage with provisions for the fitting to breakaway in case of lateral collision and auto-sense vertical collision. Safety is improved because collisions are detected and processing is stopped. This feature reduces the likelihood of damage to the material being processed and to the laser system due to collisions between material, fixturing, and carriage. Gas assist improves results for a variety of laser processing applications by directing byproducts (smoke and fumes) of laser processing away from the material, cooling materials, and changing the gas components ratio at the point of laser energy interaction with the material to increase or reduce oxidation reactions during laser processing. A high resolution camera integrated in the beam delivery carriage enables calibration of the laser system across the processing field and camera registration of materials. Calibration improves accuracy of the laser system. Camera registration allows design files to be automatically translated, scaled and skewed to align properly with preexisting features on the surface of the materials. Camera registration marks and other features of the material surface can be used. This feature protects laser systems from damage during laser processing by detecting an over-temperature event in the laser material processing area, halting laser processing and triggering an audible alarm. Additionally, this feature supports the optional fire suppression module which, if attached, can deploy fire suppressant on the material being laser processed. A unique optical assembly in the carriage provides a fixed 2” working distance from the bottom of the carriage while allowing the user to select power density. ULS offers a compressed air solution that delivers optimally conditioned clean, dry, and oil-free air to both Optics Protection and Gas Assist components. This module provides pressurized fire suppressant that can be automatically deployed on the material being laser processed in the event that high temperatures are detected in the processing area. A backup tank is present to provide continuous protection if the primary tank is deployed and has to be replaced. This optional air cleaner can be connected to a laser system to exhaust byproducts of laser material processing (particulate and fumes) from the processing area. The air cleaner removes particulate and fumes from the exhaust air using a four stage filtration process including a patented dual carbon filter. The UAC air cleaner controls exhaust flow and communicates state of the filter media to the user. This is an exhaust manifold that mounts to the arm of the beam delivery system to more effectively capture byproducts of laser material processing before they can deposit on the surface of the material being processed. This option reduces maintenance requirements and improves reliability of laser systems for applications involving removal of large amounts of material or when operating the laser system with side panels removed in optional Class 4 mode. 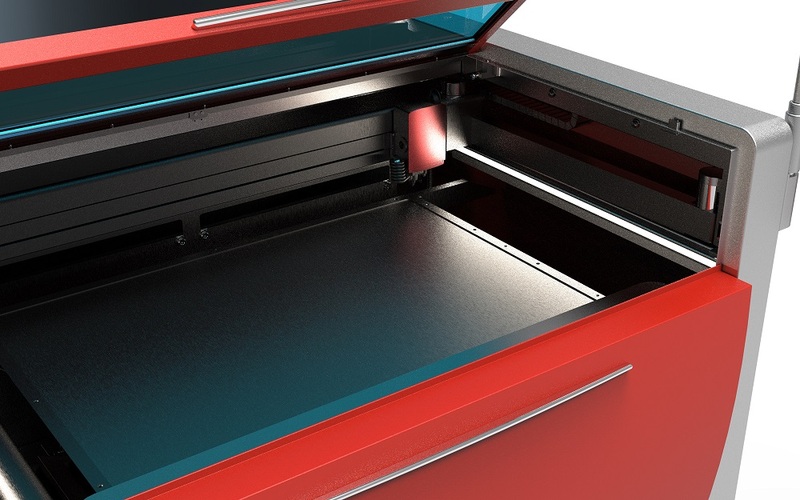 Aluminum pins to elevate rigid materials above the material support surface table to reduce back reflections. Porous carbon tiles and perforated aluminum tiles (12 x 12 in, 305 x 305 mm) to create vacuum table surfaces for thin flexible materials. Porous carbon tiles can also reduce back reflections. Dedicated pump for true vacuum hold down of materials on multi-function table. This optional fixture supports and rotates cylindrical material or parts under the beam delivery system allowing these types of materials or parts to be laser processed. This fixture can also be tilted to support tapered material. This option allows increased raster processing throughput by separating the beams from two CO2 lasers and producing two raster lines with each pass of the beam delivery system. SuperSpeed enables higher raster throughput without the wear caused by increased beam delivery travel. It also produces better laser processing results because lower processing speeds increase laser power density on material surfaces. SuperSpeed requires two CO2 lasers of same peak power and wavelength.